The Cane Corso is a big and beautiful dog breed that immediately turns heads and commands attention. One of the largest and most protective breeds in the world, Cane Corsos are physically impressive and gifted with a number of personality traits that make them very popular among some dog lovers. 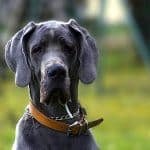 But Cane Corsos are not ideal pets for many people, so it is important to learn as much as you can about the breed before you decide to add one to your family. We’ll try to help you do so below, as we explain everything you need to know about the breed. 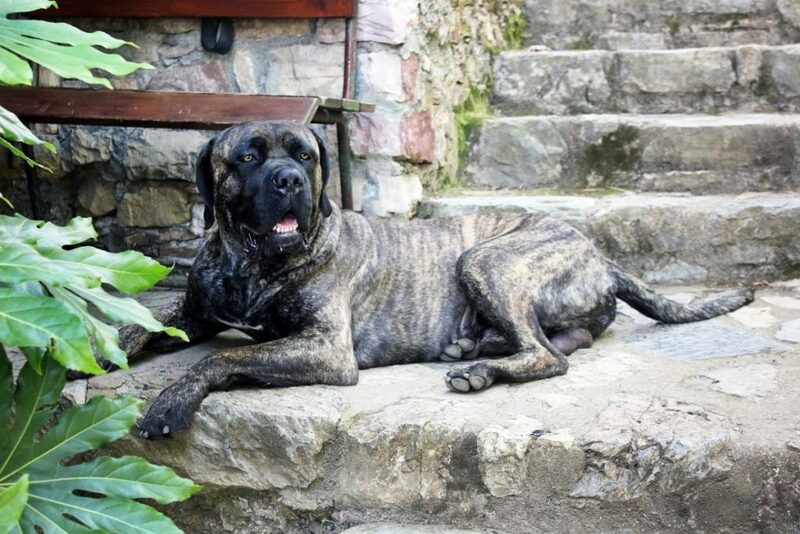 The Cane Corso was developed in Italy, from what many experts suspect were Roman war dogs. They were initially expected to perform a variety of jobs to earn their keep, including helping their owners hunt boar and other large prey, as well as guarding their home and family against threats. Some may have even been used to help with the occasional farm tasks. The breed almost disappeared entirely by the middle of the 20th century. However, devoted breeders began rebuilding the population of the breed around 1970, which also helped to boost their popularity. However, while they were well-known in Europe, they wouldn’t become available in the United States until 1983. The breed is currently recognized by the Federation Cynologique Internationale (who granted recognition in 1996) and the American Kennel Club (who granted official recognition of the breed in 2010). Cane Corsos may not be as big as their Neapolitan mastiff cousins, but they are still very massive dogs. Well-built and muscular, they typically stand a little over 2 feet tall at the shoulder and weigh about 100 to 120 pounds. Cane Corsos also have broad chests and very large heads, which helps accentuate their size even further. However, it is important to note that while Cane Corsos must surely appear formidable to those foolish enough to threaten their homes or families, their faces bear endearing expressions that their owners and friends often find quite charming. Cane Corsos are very loving, affectionate dogs, who bond strongly with their people. However, they are very confident and assertive dogs, who won’t hesitate to bully timid owners. 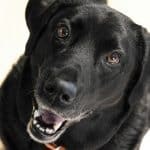 In fact, they are not a good choice for inexperienced owners – these dogs need an owner who understands how to set boundaries and provide strict, but fair discipline. Cane Corsos require very high levels of physical and mental stimulation. If deprived of fun and constructive things to do, they’ll often end up developing destructive habits. Additionally, while they need plenty of chances to run around outdoors and play, they are not “backyard dogs,” and they do not appreciate being away from their families for long periods of time. Cane Corsos are usually healthy dogs, who don’t suffer from very many breed-specific ailments. However, there are a few general health issues (which tend to be common among many large breeds) that you’ll want to watch for. For example, Cane Corsos are susceptible to bloat like most other large breeds. Bloat is a serious, potentially fatal, health condition that occurs when a dog’s stomach fills with air and twists on its axis. 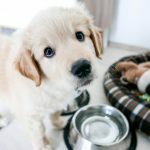 You can help reduce the chances that your dog will suffer from bloat by feeding multiple small meals each day rather than one large one, and by keeping your pet calm for 30 to 60 minutes following meals. You can also pick up a bowl that is specially designed to slow down your pet’s eating pace. Cane Corsos are also susceptible to obesity. Fortunately, this is easy to prevent by feeding your pet a nutritious food, limiting the number of snacks and treats he gets, and providing plenty of time to exercise each day. Cane Corsos are unique dogs, but their general care requirements don’t differ very significantly from most other dog breeds. 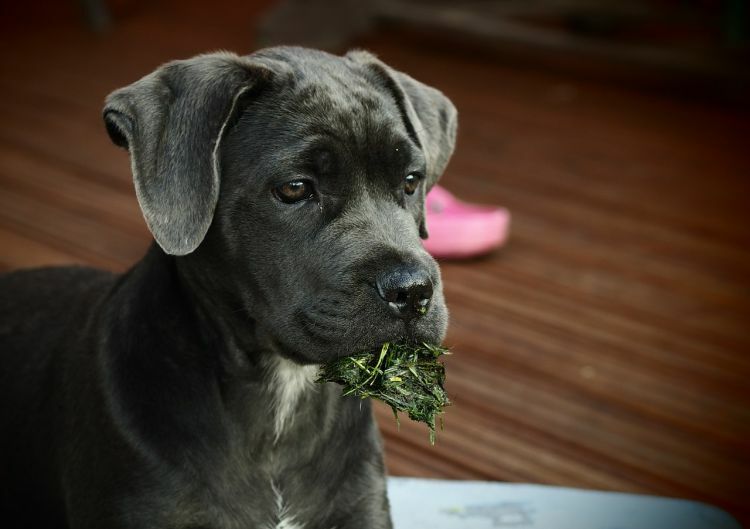 We’ll discuss the basic things you need to do to care for your Cane Corso below, including information about their dietary, exercise, training and grooming requirements. Cane Corsos can usually thrive on the same type of high-quality food that would suit any other large breed. Just be sure that the food you select is, in fact, designed specifically for large breeds. This will help ensure that your pet gets the kind of specific nutrition that large breeds require. It’s also wise to select a food that is fortified with omega-3 fatty acids, as they help to support skin and joint health, as well as probiotics – beneficial bacteria that help promote proper digestion. 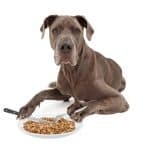 You may also want to look for a food that is fortified with chondroitin and glucosamine, which will help to protect your Cane Corso’s joints. We’ve discussed some of the best foods for large breed dogs before, so be sure to check out our comprehensive guide to large breed dog foods before making your selection. Cane Corsos are high-energy dogs who need at least 30 to 60 minutes of vigorous activity each day. Some may be able to satisfy this by running around or playing fetch in the backyard, but most will need to go to the dog park on a daily basis. Additionally, you’ll need to keep your Cane Corso’s brain “exercised” as well. Cane Corsos are working dogs, who need a job to do. Deprived of something to do, they’ll often begin exhibiting problematic and destructive behaviors. Your Cane Corso’s “job” can be just about anything, as long as it keeps their brain busy. 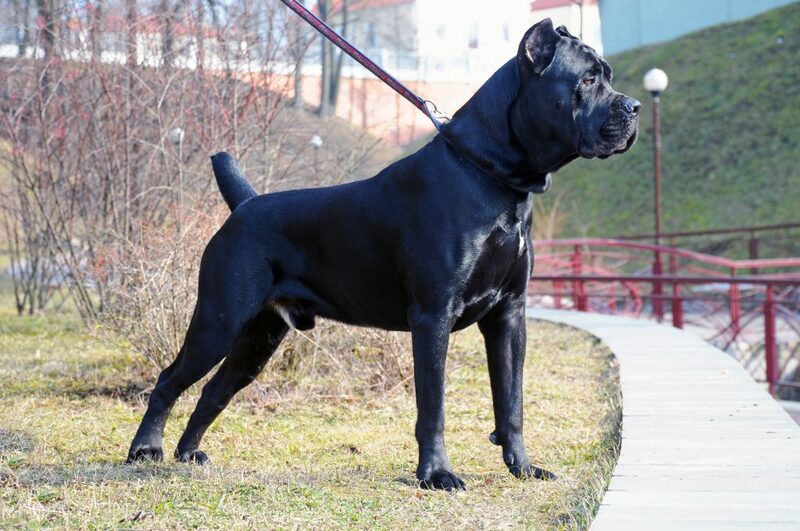 Often, owners have success by simply making their Cane Corso perform obedience tricks or skills before they are given any resources (food, attention, toys, etc.). 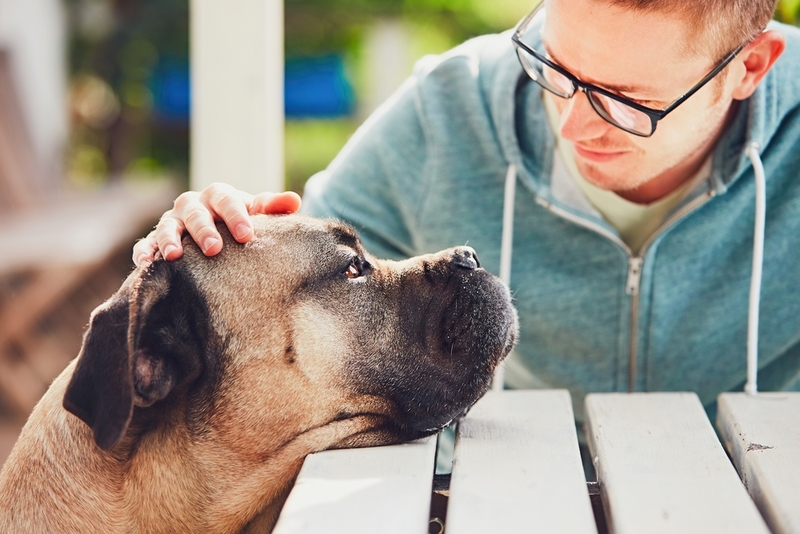 Cane Corsos are usually good-natured dogs, but given their size and protective instincts, training and socialization are critically important. Start by housetraining your new Cane Corso the very first day you bring him home (a good crate will make this easier to accomplish and also give your pet a safe and comfortable place to sleep at night). Once your puppy reaches about 8 weeks of age, you can begin basic obedience training. Start introducing your new pet to other people as quickly as possible and make sure he spends plenty of time bonding with all of the members of your family. Just be sure to wait to introduce your puppy to other dogs until your vet has declared it safe to do so. Young puppies are vulnerable to a variety of illnesses until they’re received all of their vaccinations. Cane Corsos don’t have any special grooming needs. They have pretty low-maintenance coats, which are pretty easy to keep clean. 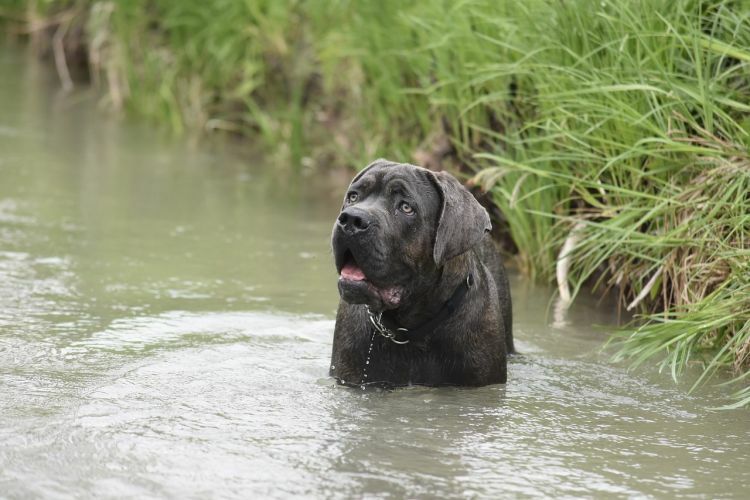 Regular baths are a good idea, but your Cane Corso will likely only need one every month or two to stay clean and prevent odors. Cane Corsos have short hair and don’t shed very much during the bulk of the year. They do, however, shed very heavily about once every six months (typically during seasonal changes). You can bathe and brush your Cane Corso during these periods of heavy shedding to help reduce the amount of hair your pet leaves around your home. It is also important to trim or file your Cane Corso’s nails regularly. This can be challenging for Cane Corsos who don’t enjoy the process, so be sure to get your pet used to the procedure while he’s young. Cane Corsos aren’t a very common breed, so you’ll need to do some homework to track one down. There are a number of good breeders in the U.S., and you may even be able to find one at a rescue. You can start your search by checking the American Kennel Club’s puppy finder. Alternatively, for those who’d rather adopt, the Cane Corso Association of America lists a few rescue operations on their website, which may provide useful in helping you find a Corso of your own. Many people thinking about getting a Cane Corso have questions about the breed. We’ll try to answer a few of the most common questions prospective owners have about the breed below. No dog breed is truly hypoallergenic. However, dogs who have short coats and shed relatively little typically cause fewer problems for allergy suffers than heavily shedding, long-haired breeds do. Accordingly, those with allergies may find that Cane Corsos are a good choice. Are Cane Corsos good for apartments? No. Cane Corsos like to be with their families, so they don’t want to be in the backyard all day long. However, they still need regular opportunities for exercise and play. In most cases, Cane Corso owners should have a large, fenced yard. Cane Corsos can be very good with children, although, as with any other large breed, caution and supervision are always required. This is especially true of unfamiliar children. Typically, they tend to be quite protective of children in the family. Are Cane Corsos legal to own? Cane Corsos are not prohibited at the federal level in the United States, but they are banned from several municipalities. 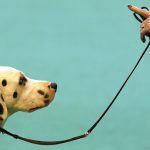 Additionally, some insurance companies will not insure owners of the breed. Accordingly, you’ll want to be sure to do your homework before adding a Cane Corso to your home. Cane Corsos are intelligent, people-pleasing dogs who are often relatively easy for experienced owners to train. However, they will often frustrate and challenge first-time owners. Wrapping Up: Is the Cane Corso Right for Your Family? Cane Corsos may not be a very familiar breed, but they have plenty of devotees who love the breed’s combination of size, intelligence and beauty. They’re also extremely loving dogs, who bond strongly with their families. Further, Cane Corsos are usually healthy animals, who don’t present many significant care challenges. In short, there’s a lot to like about the breed. However, because they are such large, powerful and confident canines, they demand respect and they are not ideal pets for all people. Cane Corsos require experienced owners, who understand how to lead their pet in a calm, but assertive manner. Also, given their energy levels, they need an owner who is willing and able to give them enough exercise and stimulation. Nevertheless, those with the experience and resources to give a Cane Corso a good home may fall in love with the breed.